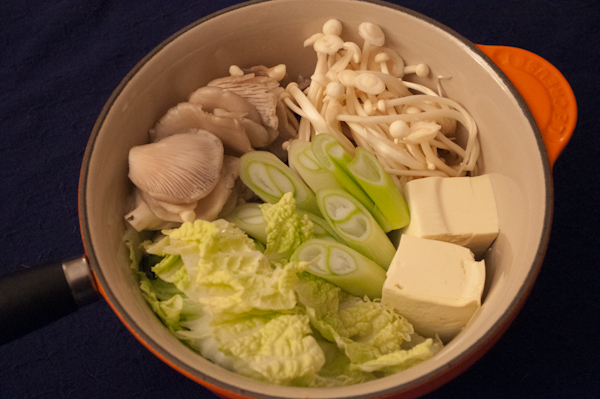 Two kinds of mushrooms, harusame, Napa cabbage and some tofu all went into the pot, and I even managed to source some genuine negi, rather than relying on my usual substitution of green onions. A little homemade ponzu on the side elevated the meal to pure deliciousness. If you’ve never made Japanese-style hot pots, I encourage you to check out the book, or at least the recipes on the authors’ blog. It’s the perfect approach to eating at this time of year, since it warms both body, through the food and broth itself, and your soul, through the communal approach to eating. Ponzu is a Japanese condiment served with a variety of foods, including grilled meats, some types of sashimi and nabe dishes such as this one. It’s a thin sauce, served in a small dish or bowl, into which you dip each bite of food just before popping it into your mouth. The tartness of the sauce nicely complements rich and fatty foods. Bottled ponzu can be bought in Asian grocery stores – and an increasing number of mainstream supermarkets – but nothing beats homemade! It’s traditionally made with yuzu, an aromatic Japanese citrus fruit that’s difficult to find and expensive to buy in North America. Lime juice works well as a substitute, but you could also use lemon juice or a mix of the two. Combine all ingredients in a Mason jar or other sealable container, refrigerate for a couple of hours or up to overnight to allow the flavours to blend, then serve in small dishes for dipping. You can adjust the sweet/tart balance by adding more mirin (or white sugar) or citrus juice. I’m a bit late in saying it, but let me take this opportunity to wish you all a Happy New Year!